Today was the day I got to play with my new toys for the first time. Along with a couple of almost willing but most definately pressganged friends to help, should I not be able to manage on my own. 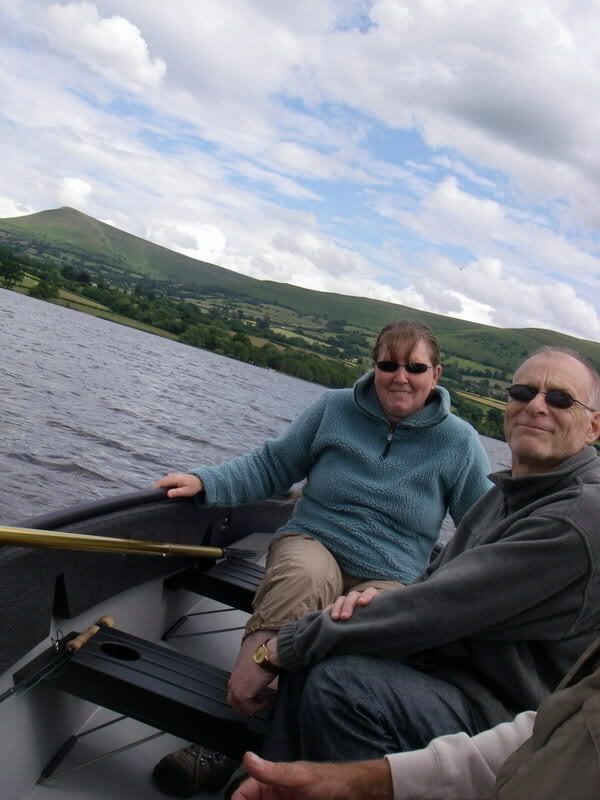 I took my new boat and engine the one and a bit hour trip to Langorse Lake near Brecon. Suprisingly, I had managed to do the jigsaw puzzle involved in getting everything except the roof-racked hull inside the car, including my two passengers. Honest - proof later in photo form. 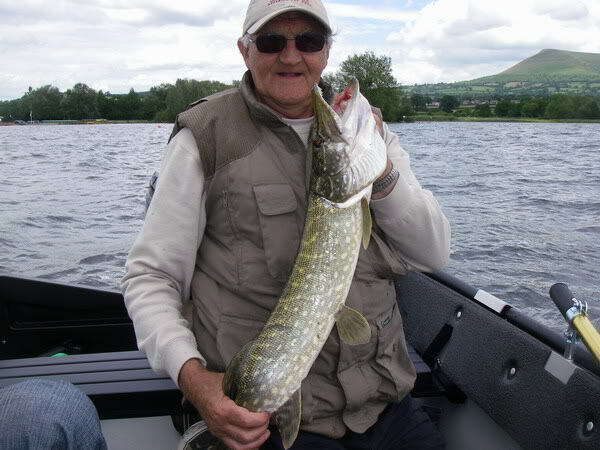 On arrival at the lake and having paid the required fee's, I was gratefull to see just a light 6" wave on the water. Having read the "distructions" for boat assembly and running in the 3.5 HP Tohatsu outboard just last evening and hoping I could remember everything in the correct order, I set to work. 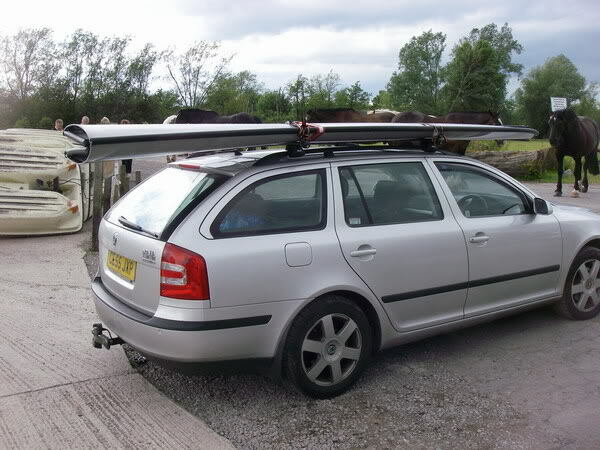 Boat unstrapped and lifted down from the roof rack, opened using the provided magic stick, seats, transom and wheels fitted. 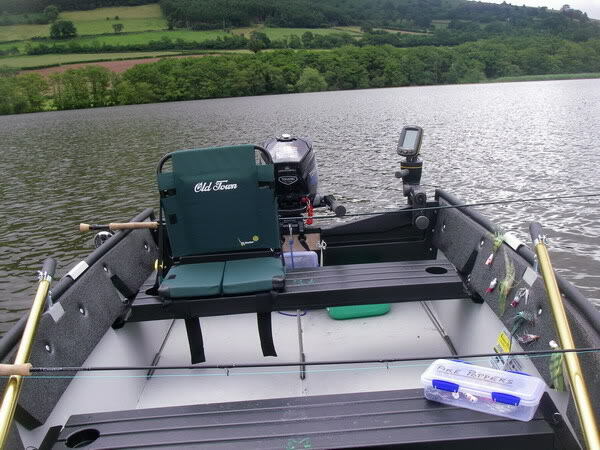 Engine afixed, with spare fuel, oars and my piking tackle chucked aboard took me less than half an hour, - on my own. No help required. Not bad at all when going very carefully as it was my first attempt. Everything double checked, theres lives at stake here. Susan insisted on doing the naming ceremony - "I name this ship Predator, may god bless etc, etc." Wheeled to the water and given a gentle launch, we all climbed aboard, the engine fired second pull and off into the main bowl of the lake. at the other end of Predator. I thank them both for that. As I was limited to trolling speed, due to the need to run in the engine, it seemed sensible to sling out an intermediate with a flashy silver tinsel fly on the end - just in case. As it happened - this one was hungry enough to oblige me with a take. Named, launched and christened all in one day. Can't be bad. Toddled gently around, with no more offers for a couple of hours, when the rain started. Easy decision to go back to the launch ramp to stay dry. Beached. In the background you can see the hire boats at Langorse - Not the best I've ever been out in. Ready for home. All in about 20 mins as I had that jigsaw puzzle pretty well sussed, second time around. Extremely happy with the performance of both boat and engine - especially as we were hit by the bow-wave from an inconsiderate skier towwing power boat who roared past us several times. 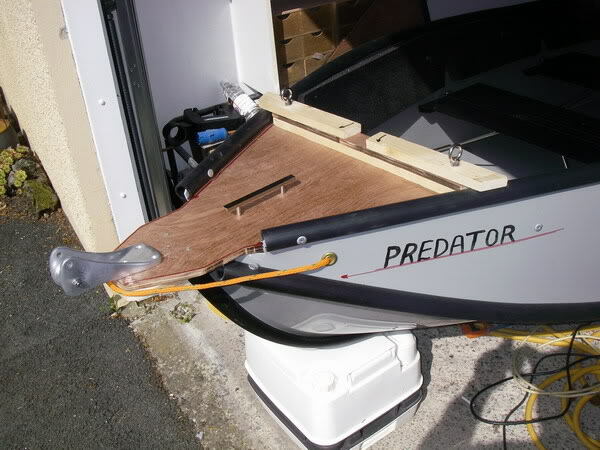 Needn't have worried - Predator just "flexed" over the wave, remaining very stable. Now that was different to a rigid. And yes, I know we should have had life jackets on But at Langorse they are not, as far as I know, provided. One between three didn't seem a workable idea. Am I glad I spent the money on my new toys ? ........ You bettcha. 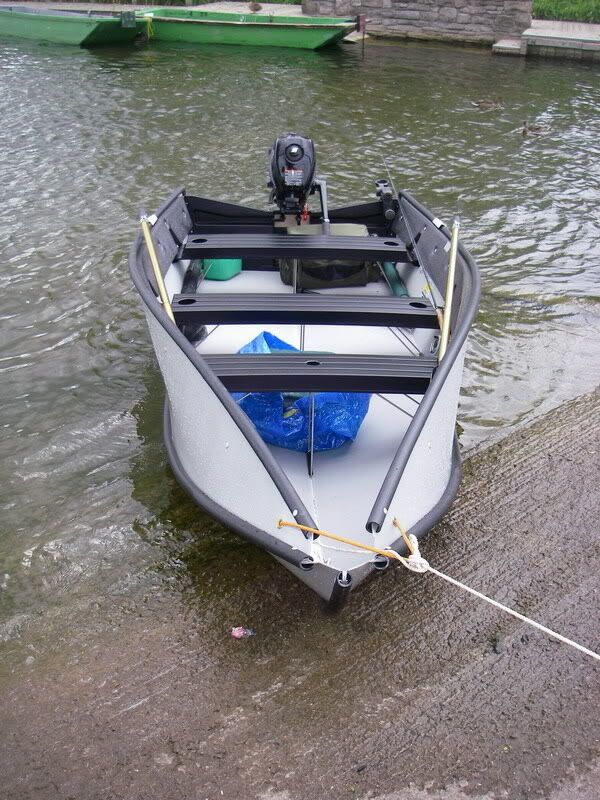 hi lakefisher, glad you are happy with bote, just a wee note, there should be a small cover which you fix on to the prow of the bote, did you not receive one with it. ? if not contact compay for one. 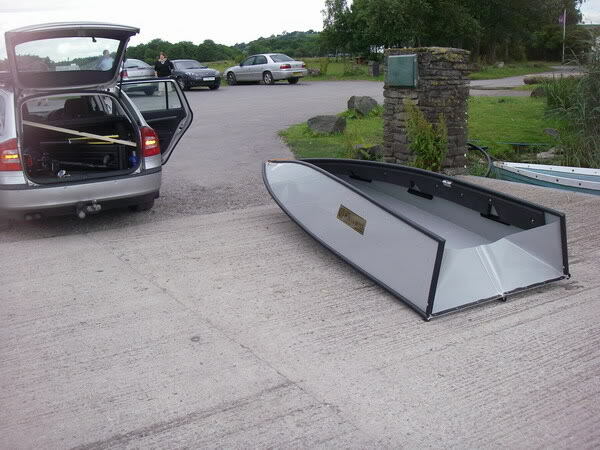 As your friend has one - you might like to point him towards these sites as they contain many great idea's for making an excellent boat even better. As you will realise - I did a lot of research before I purchased mine. hi tony, thanks for info, i will pass it on, the solid bow cap fairly sets it off. we also had a launching ceremony, a wee dram of malt for the boat, and a large dram for us, his bote is named " charlie girl " after his dog.!!!!!!! Photographed here is my first "in the rough" attempt at the solid bow plate I mentioned earlier in this post. Anchor pulley and cleat/lifting handle fitted. Two eye bolts to give somewhere to attach one end of a paradrouge. 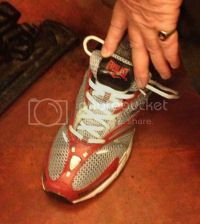 The two pieces under the eye bolts swivel (arrows) to either clamp or release the bow plate. Now I have ample excuse for extensive field testing If it works without problems I'll give it some varnish and protection. If not - its back to the drawing board. 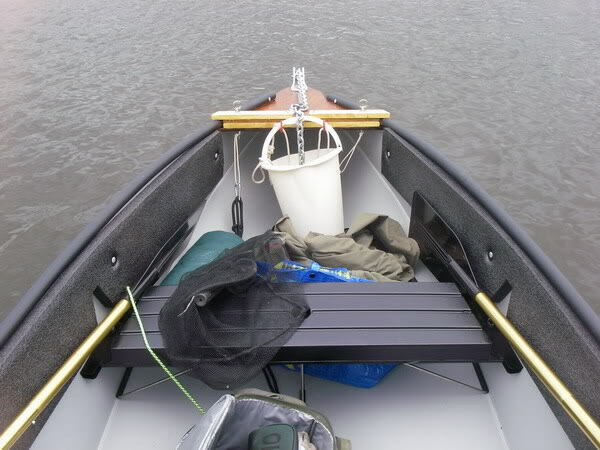 hi tony, bow plate looks really smart, especially when it can be released quite simply, we had to keep pulling the bote clear of the water each time, this means it can be tied safely to the bank or jetty. will pass it on to b.l. 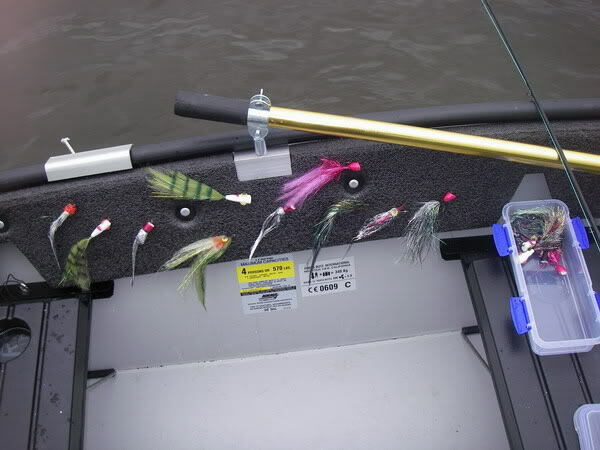 Screw in style rod holders for trolling and back drifting are currently being thought about. Anyone got a 3/8" B.S.F. tapping drill and tap I could borrow. Usefull stuff, that floatation foam, gives me somewhere to dry my flies. I also have a porta-bote (10ft) and have been very pleased with it over the past 3 years. 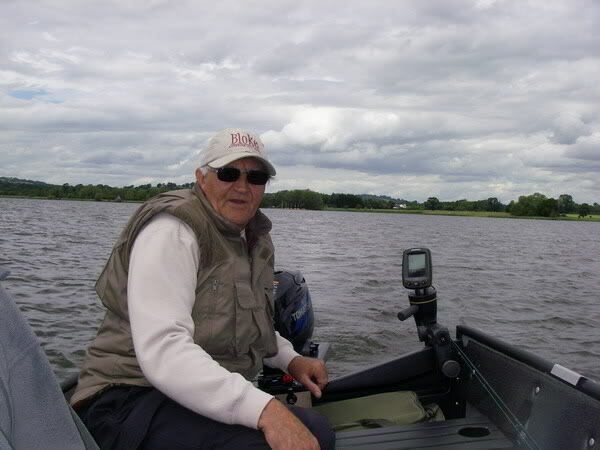 While I have been able to use it on holiday in Ireland and on very calm days in the sea, I am finding great difficulty in finding any trout waters in my area (Shropshire and North Wales) that will allow me to use it. 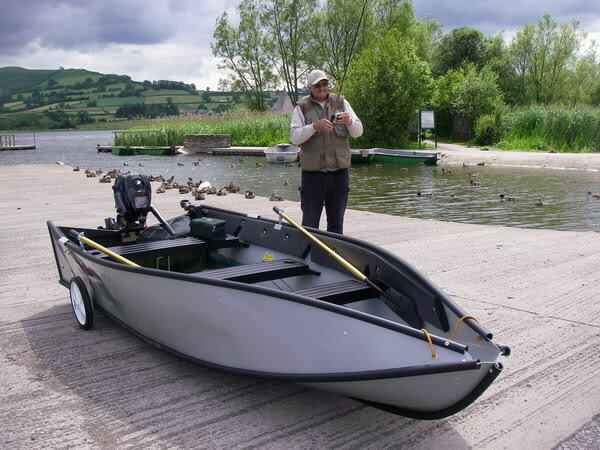 As I have now retired, I need to reduce the cost of my fishing trips and being able to use my own boat would be a considerable saving.